Broadband Seismic Data Collection Center (ANZA) :: Special Events :: Why does Oregon get so many earthquakes? 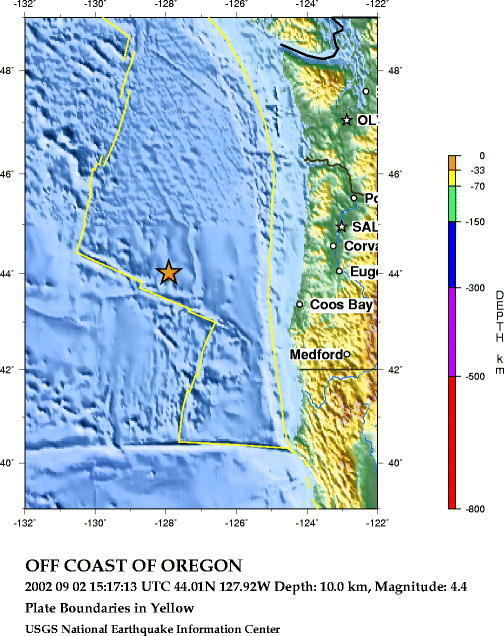 Location: Home » Special Events » Why does Oregon get so many earthquakes? Why does Oregon get so many earthquakes? Figure 1: Location of the earthquakes relative to the continental USA. (© USGS). Figure 2: Regional schematic plate boundary map (© USGS). From August 22 to September 2, 2002, there were six earthquakes that were between 4.7 to 5.7 in magnitude off the coast of Oregon. Why? The answer to this question relates to the tectonic plate configuration in the region. Figure 2 is a schematic map of the tectonics of the region. Note that the seafloor of the Pacific Ocean off the coast of Oregon is defined by a complex plate configuration that includes the oceanic Pacific Plate, the continental North American plate, and the oceanic Juan De Fuca microplate. The latter is called a microplate due to its small size relative to the larger adjacent oceanic and continental plates. As the plates move relative to each other, they have to overcome great forces. Often when the plates move, earthquakes occur in the vicinity of the movement. Many movements in the same region can cause the development of a transform fault, that acts as a line of weakness between the plates and will therefore preferentially accommodate any movement. There is a high frequency of earthquakes in specific locations off the coast of Oregon due to the transform faults in the region that include the Blanco and the Mendocino fracture zones (see Figure 3) which accommodate the motion of the plates in question as they jostle for position. Figure 3: Schematic map of the regional plate configuration (© USGS). The seafloor topography (Figure 4) shows the location of the transform faults and also the epicenter of one of the recent earthquakes off the coast of Oregon in the last two weeks. Note how the epicenter of the event is close to the Blanco fracture zone. Below is a table and a map of the locations of all magnitude 4 and bigger earthquakes that have occurred in the region, with their respective magnitude and depth. Notice how they are all very close to each other! Figure 4: Bathmetry and topography map of offshore Oregon (© USGS). For more information on recent earthquakes in the region visit our realtime network pages, that are updated automatically every 30 minutes. For more information on the Juan De Fuca microplate, click here. All images courtesy of the United States Geological Survey. More information on the events may be available at the IRIS.